Current Issues in Nursing provides a forum for knowledgeable debate on the important issues that nurses face today. This resource provides the opportunity to analyze conflicting viewpoints and develop your own thoughts on demands being made for the nursing profession and the difficult issues affecting today's health care delivery. Continually praised for its in-depth discussion of critical issues, solid organization of material, and encouragement of independent thinking, you’ll find this text a valuable resource in the modern world of nursing. UNIQUE! Over 100 well-known contributors offer their expert insights and analysis. UNIQUE! 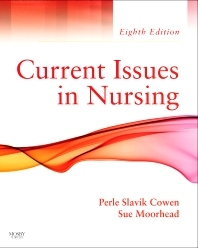 Viewpoint chapters present controversial issues to showcase pressing issues facing nursing today. 1 What is Nursing, Why Do We Ask, and How Will Nursing be Better Understood? 2 Staff Nurses Working in Hospitals: Who Are They, What Do They Do, and What Are Their Challenges? 8 Nurse Researchers: Who Are They, What Do They Do, and What Are Their Challenges? 21 Hospice and Palliative Care: One Solution for Improving U.S. Health Care? 56 Should Nursing Be More Diversified? 62 Ethics of Health Care Reform: Should Health Care be Rationed? 63 The Nurse as Patient Advocate: Is There a Conflict of Interest? 68 Nurses’ Role in Patients’ Advance Directives: Facilitation or Reduction of Patient Autonomy?